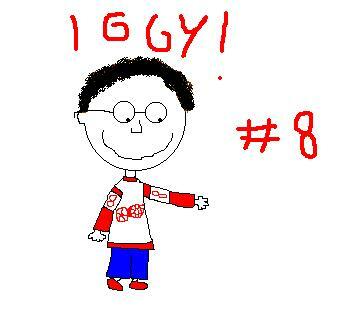 As of the summer of 2000, Igor Larionov is no longer a member of the Detroit Red Wings hockey team. He instead has opted to spend what could be his last year of play in Miami, Florida with The Florida Panthers. 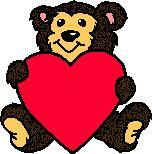 I wish Igor lots of love , success and well wishes. No matter what team you are on I will back you! Today NHL fans get to see the greatest players in the world, including the Russians. We are in awe of the Sergei Federovs and Pavel Bures, and the fans and current players all it all to players like Igor Larionov. Igor Larionov is only of the most highly skilled players we have ever seen. His best days were left behind in the old Soviet Union, but he still has excelled at the NHL level more so than any other of the veteran former Red Army teammates. He battled and communist regime of the Soviet Union for the right to play pro hockey in North America. 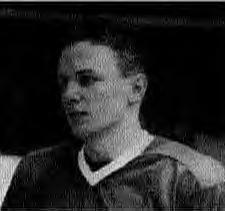 A member of the Central Red Army Team in Russia for eight seasons, Larionov centered the famous KLM line with Vladimir Krutov and Sergei Makarov during the 1980s. He earned Soviet Player of the Year honours in 1987-88 and was named to five all-star teams with Central Red Army. He also starred in many international competitions with the Soviet National Team, including capturing gold medals at both the 1984 and 1988 Winter Olympics and a gold medal at the 1983 World Championships. But Larionov never wanted to play for the Red Army. He wanted to serve his mandatory 2 year term in the Army and return home and play with the local team in Voskresensk. Russian Hockey dictator Viktor Tikhonov wouldn't allow the skilled center to leave, and pulled his communist strings to force Larionov to stay against his will. 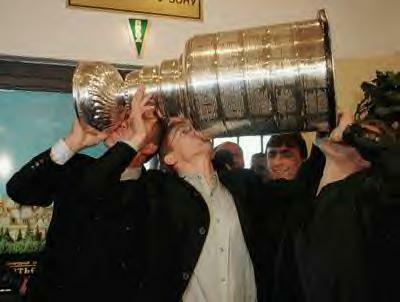 Larionov, along with Slava Fetisov, were particularly outspoken and wanted to be able to leave Russia as a reward for their years of service and persue a career in the National Hockey League. Eventually won Larionov won his battle and was allowed to play in the NHL. He made his NHL debut with the Vancouver Canucks in 1989-90 and played three seasons. It was a period of adjustment both on the ice and off it, Larionov's obvious skill and puck sense captivated the league. Only Wayne Gretzky is in the same class when it comes to hockey sense, and puck creativity. Although he never wanted to leave Vancouver, he refused to sign in 1991 because of the Russian interferance in negotiations. He wouldn't allow any transfer payments to be sent to the powers-that-be in his old country. He played that year in Switzerland before being acquired by the San Jose Sharks in the 1992 Waiver Draft. Larionov soon found himself trade to Detroit where he was reunited with Slava Fetisov. Along with Sergei Federov, Slava Kozlov and Vladimir Konstantinov, the 36-year-old Larionov played a large role in helping the Detroit Red Wings win the Stanley Cup for the first time in 42 years in 1997. He had 12 goals and 42 assists in 64 games, and four goals and eight assists in 20 postseason contests. "Igor was a very important part of our hockey club, a very important part of our winning the Stanley Cup last year. He's a very creative, playmaking center-ice man. Not only is he important on the ice, but as well (for) what he brings off the ice, in the dressing room." In 440 career NHL games from 1989-97 with Vancouver, San Jose and Detroit, he has compiled 107 goals and 243 assists for 350 points. There is little doubt that little Igor Larionov will be inducted into the Hockey Hall of Fame. And as good as he has been since joining Vancouver in 1989, its a shame we didn't get to see Igor Larionov in his prime. Scouting Report: "The neat thing about Igor Larionov is not only is he a great player, but he wants to succeed, the team to win, the coach to be successful and each of his teammates to maximize his potential." Totalled 24 points (4 goals, 20 assists) in 33 games . . . Bay Area Professional Hockey Writers' Association nominee for Bill Masterton Memorial Trophy (qualities of perseverance, sportsmanship and dedication to hockey) . . . recorded two 4-game scoring streaks (Jan. 20-28 and April 19-26) . . . had back- to-back 3-point games vs. Edmonton on April 7 and 9, including his only 2-goal game of the season on April 7 . . . tied as Sharks all-time career plus/minus leader at +17 . . . Playoffs: Tied for team lead in scoring with 9 points (1 goal, 8 assists) in 11 games . . . scored at least 1 point in 7 of 11 playoff games . . . had multiple-point nights in Game 4 (0 goals, 2 assists) and Game 7 (1 goal, 1 assist) of Calgary series . . . 1 of 7 Sharks to play in all 25 playoff games in Sharks history. 1993-94: Recorded 2nd-most points in NHL career with 56 points (18 goals, 38 assists) in 60 games . . . finished tied for 2nd on club in assists and 5th in points . . . led club in plus/minus ranking with +20 (Sharks record) and in shooting percentage with 25.0% (18 goals on 72 shots) . . . had points in 39 of his 60 games, including 13 multi-point contests . . . turned in 4-point outings 3 times, including March 25 at Winnipeg, where he got his 2nd hat trick of the season . . . had team record-tying 4-assist performance March 6 vs. Anaheim . . . missed 19 games because of injury or illness; Sharks went 30-20-10 with him in lineup, 3-15-6 without . . . scored 33 points (7 goals, 26 assists) over his last 34 games . . . Playoffs: Team's leading scorer in the playoffs, scoring 18 points (5 goals, 13 assists) in 14 contests . . . scored in 10 of 14 playoff contests . . . 1992-93: Played season in Switzerland with Lugano, scoring 29 points (10 goals, 19 assists) in 24 games . . . rights were acquired by San Jose in 1992 NHL Waiver Draft . . . Other: Played 3 previous NHL seasons with Vancouver (1989-92), including 1991-92 when he scored 65 points (21 goals, 44 assists) in 72 games, adding 10 points (3 goals, 7 assists) in 13 playoff contests . . . had a hat trick Dec. 28, 1991 vs. Sharks, scoring 1 goal each on the power play, short-handed and even strength in 3-2 Canucks victory . . . before joining the Canucks, played 12 seasons (1977-89) in the Soviet National League, totaling 437 points (207 goals, 230 assists) in 463 games . . . played 4 seasons with hometown team Khimik Voskresensk followed by 8 seasons for Central Red Army . . . earned Soviet Player of the Year honors in 1987-88 and was named to 5 all-star teams . . . veteran of various international competitions with Soviet National Team, including capturing gold medals at both the 1984 and 1988 Winter Olympics and a gold medal in 1983 World Championships . . . in the latter, scored 12 points, earning All-Star first team honors . . . centered famous KLM line with Vladimir Krutov and Sharks winger Sergei Makarov, known throughout international hockey as one of the most potent offensive line combinations during the 1980s. He and wife Elena (former Soviet figure skater Elena Botanova) have two children -- Alyonka and Dianna. The family purchased a new home in the South Bay and spent most of the summer traveling in Northern California. Igor is from small Russian town of Voskresensk that has produced current NHLers Valeri Kamensky (Colorado), Valeri Zelepukin (New Jersey), Andrei Lomakin (Florida) and current Sharks prospect Alexander Cherbayev. Igor has worked hard to help better his native Russia by organizing the Russian Good Will Tour during the 1994-95 labor stoppage and raising funds for Russian youth hockey players who could not afford to play otherwise. Igor works at Stan Smyl's hockey school in the summer. Brother Eyvgeni is a scout with Dallas. Enjoys playing tennis and soccer and listening to the music of Bruce Springsteen, Phil Collins and Rod Stewart. Drafted by Vancouver in 1985 (11th round, 214th overall). Acquired by San Jose from Vancouver in NHL Waiver Draft on Oct. 4, 1992. Igor Larionov did not seem like a savior at first. He was a great but fading player, according to the talk around the league, when he joined the Sharks for the 1993-94 season. But his pivotal role in the destiny-altering events of that season brought the club to maturity, cementing his place in team history. "He will always maintain the mantle of one of the most important players in Sharks history because when he arrived in the Bay Area, the franchise was in desperate need of credibility and he was very much responsible for lighting up a whole community and turning them on to hockey," said Sharks Executive Vice President and Director of Hockey Operations Dean Lombardi. "He was as important to San Jose as Gretzky was to Los Angeles." The sense of excitement the team stirred up in the community made a big impression on Larionov. "We have a Russian expression: A good fan is not only there in the sunshine, but even in the rain," he said. "So, for example, when we were losing to Toronto in Game 4 of the playoffs that season, 8-3, the people were still cheering for us. I was sitting with my parents in the stands the first week in January when we lost to Detroit. I hurt my knee and couldn't play. The score was 10-1 for Detroit and then Pat Falloon scored a goal and there was almost a standing ovation. That was incredible. It was incredible when we came back from Game 7 in Toronto and there were about 400 people at the airport at 4 o'clock in the morning." The Sharks acquired the rights to Larionov on waivers October 4, 1992. There is no doubt he would have made a difference on the ice that season. No one likes to think about it now, but that was the year the Sharks set an NHL futility record, finishing 11-71-2 and establishing a league record for losses. "It isn't every day you could pick up a No. 1 center on the waiver wire," recalled Executive Vice President and Director of Player Personnel Chuck Grillo. "It was probably the only good player move we did that year. Everything else was pretty much a disaster. The coaches that year would have liked to have had him on the ice." But the Sharks knew they weren't getting Larionov right away, if ever. He turned 32 that year and spent it in self-imposed exile in Switzerland, playing for Lugano of the Swiss League, where he had a three-year contract. He decided to play in Europe rather than sign a new contract with the Vancouver Canucks, his team for his first three NHL seasons. Prior to that, he played eight years for the dominating Central Red Army team in Moscow. A new contract with the Canucks would have meant substantial transfer fees for his old nemeses in Moscow, and Larionov, a man of conviction, took a stand. His season in Switzerland was not spectacular (13 goals and 34 assists in 32 games), but he enjoyed the exposure to life in Switzerland which provided an opportunity for him to work on his Italian. The year away also gave him an invaluable tool: He had joined the Sharks two summers before, having experienced close to nothing of the previous Sharks season. It was not real to him. He arrived in camp talking passionately and proudly about winning, an approach that sounded more like a foreign language than the Russian he exchanged with Sergei Makarov, also new to the Sharks then. "From my point of view, me and Makarov played together for so many years, we've got a winning spirit, because we played on the winning team," Larionov said before arriving at his first Sharks camp. "Our goal now is to try to develop some skills and put some winning spirit on this team, because after last year it's very important to get some fans excited during the season. I don't want to be just [an average] player, I also want to be a team leader." v This sort of talk made people in the organization respect Larionov. His career had been built around being a skilled athlete who was also smarter and more creative than most players. He demonstrated an eagerness and willingness to teach this to young Sharks players, whether they were North American-born (like Ray Whitney, his first left wing that year) or not. He offered tips and suggestions, but, more importantly, he also led by example even though he understood, as he entered that season, that his play might not be at the level he wanted it. "Let's face it," Lombardi said, "he didn't have great success in Europe. "he was coming off a year away from the grind. Playing in Europe he could move around on the bigger ice surface and not get hit. But we know he was better than anything we had. The closest real player we had had next to him was Kelly Kisio, a different type of player but a bona fide NHL center." "When we had 11 wins, we had a team that couldn't pass a puck twice. We didn't have a lot of skill. When Larionov and Makarov came, it was like some huge revelation when you saw these guys who could make all these plays," said Grillo. "Those were the first guys to entertain the Bay Area with the skill level that's possible in this game," added Lombardi. "The trouble is, it went from one extreme to the other. It went from nothing to two of the greatest players in the world. I always said people would get spoiled watching them." Larionov and Makarov, teammates on the Soviet teams that dominated international hockey in the 1980's, winning multiple World Championships and Olympic gold medals in 1984 and 1988 to help put the horror of Lake Placid (from a Russian perspective) behind them. The pair brought more to the Sharks than slick moves. They possessed the arrogance and sense of purpose of athletes who have had events prove their self-belief justified. They felt like champions, thought like champions and approached the game like champions. This brought immediate respect in and out of the locker room. Makarov had the greater career in Russia, but he was not the type of man to take a leadership role--either in his home country or in North America. However, leadership came naturally to Larionov. He had fought epic battles and his legendary disputes with the authorities in the Soviet Union, becoming the Sakharov of hockey in many ways, along with teammate and current Detroit Red Wing Salva Fetisov. "Larionov is the most important athlete in the history of Soviet sport, leading the campaign for Soviet athletes to play abroad without defecting," said Robert Edelman, the author of the definitive study "Serious fun: A History of Spectator Sports in the U.S.S.R."
Larionov had ideas about how the Sharks should play and these ideas put him in immediate conflict with then rookie coach Kevin Constantine that first season. During the summer, they met and Constantine asked for his advice in dealing with the mercurial Makarov, who had often clashed with Calgary coach Dave King. He didn't play well for them," Larionov told Kevin. "He wasn't playing with heart." "Just let him play," is what Larionov told Constantine. "He's 35 years old and a world-class player. Dave King made a big mistake. He tried to change him. He started to teach him how to play dump-and-chase hockey. Just let him play and he will give you more effort and more success than even you could expect from him." Although Constantine was hesitant at first, Larionov was able to convince him otherwise. Larionov reminded his new coach that he "couldn't compare Makarov with the guys who were here last year." The clash of styles and views defined the course of the season. Larionov separated his shoulder and did not play a complete game until the Sharks had already gotten off to an ominous 0-8-1 start. In his first game back, he scored a power-play goal and helped the team to its first victory of the season, a 3-1 win over Edmonton. It was evident, once he started playing, the team looked 100 percent better. Soon a fivesome of Larionov in the middle, Makarov on the right, Johan Garpenlov at left wing and Sandis Ozolinsh and Jeff Norton as defensemen was established. Larionov's importance to the team was evidenced by the club's 30-20-10 record with him in the lineup. 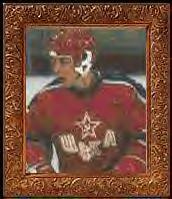 Larionov's strong view and personal convictions generated friction at times. He's widely regarded as a fun player to be around, easy-going, very intelligent and quick with a joke, but he also carries around memories of the years in the Soviet Union when he was ordered around by coaches. Due to those memories, he is not afraid to add his two cents. "I think the occasional stubbornness and singularity of focus on winning go hand in hand," Lombardi said. "but sometimes off the ice, when everything isn't black and white, I don't think singularity of focus is always admirable. In day-to-day life there has to be some flexibility. Maybe that's a product of the Russian system, I don't know. Maybe you had to be that way to survive, but I don't find that always attractive." "By nature people from that society are distrustful, they don't trust anyone, and I think that's carried over. So when you try to make them do something, they always think you're trying to stick it to them somehow. They always think you have an ulterior motive. When your motives are pure and you're being questioned, it's frustrating." Constantine put the Larionov line together and, gradually as the season progressed, gave them more latitude to play the game their way. "Basically they're both stubborn--Kevin is just as stubborn as Igor," Lombardi said. "You have to give Kevin credit for adjusting. He's as stubborn as they come and for him, in the position of ultimate power, you have to give him credit: He bent." As a result, the Sharks made the playoffs and stunned Detroit in a seven-game, first-round upset that earned an instant place in hockey history. Other players made major contributions that season, including goaltender Arturs Irbe and savvy veterans like Gaetan Duchesne and Bob Errey, but the Larionov line's contributions were the key. Larionov led the Sharks in playoff scoring and was among the league leaders when the Sharks were eliminated in Game 7 of the second round by Toronto. "I always talk about down the stretch that season," Lombardi said. "Makarov got hurt, everyone was waiting for us to cave in and Igor was playing as well as Wayne Gretzky. How did he do that? I don't know. how did Joe Montana get it done all those times? There are not only great athletes, there are guys who have that special quality and get it done at crunch time." Steve Kettmann now covers the Oakland A's beat for the San Francisco Chronicle. He covered the Sharks during their dismal second season in 1992-93 and the next campaign--during Larionov's first with the team. Kettmann and Larionov are working on an autobiography of the Russian superstar, the second book written about the Voskresensk, Russia native. The KLM-troyka, as they were called, replaced the officertroyka and did it in a splendid way. 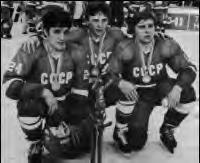 The three forwards, together with Kasatonov, Fetisov and Tretiak all got in to the all-star team in 1983. This is the only time that players from only one nation is represented there. Not hard to imagine if you ever saw them play. Larionov as the thinker, Krutov as the worker and Makarov as the speeding bullet. All of them later went to the NHL but never played together as a line again. Too bad! This is from Mlive ............ Analysis: Climbing payroll may force Larionov out of Detroit Monday, January 10, 2000 DETROIT - Benefits of the doubt come less frequently at age 39. Igor Larionov may be a future Hall-of-Famer and one of the best players ever produced by the former Soviet Union. He may have been a key component of two Stanley Cup champions and may be one of the most respected players in the Detroit Red Wings' dressing room. As great as those accomplishments are, Larionov is a player one year shy of 40 facing an uncertain future. The Red Wings pulled a two-year contract extension off the table last week just as the two sides seemed days away from a deal. "There's been a stoppage in my contract," an unusually terse Larionov said. "I'm not happy about it. That's all I can say now." Blame it on the changing economics in hockey and in Detroit, which is what general manager Ken Holland did. Or blame a recent slump that cast doubt on Larionov's continued effectiveness. Criticize the Red Wings for lacking loyalty. Or fault Larionov and agent Don Baizley for waiting and driving too hard a bargain. What is clear is that negotiations have ended. "The talks have stalled and I've stalled them," Holland said. "We're going to let this sit for a while. I don't know where this is going." Holland said he backed away from the deal because of the sharp increase in salaries on the Red Wings. "We've got a payroll problem," Holland said. "We're trying to manage a payroll." The Red Wings' payroll is $50 million - counting Sergei Fedorov at his average of $6.3 million and the chance of suspended Uwe Krupp making $4.1 million eventually. To keep the current team together might cost $60 million next season. Holland must negotiate new deals for Brendan Shanahan, Chris Osgood, Slava Kozlov, Steve Duchesne, Kris Draper and Aaron Ward, and decide about exercising a $3 million club option on Larry Murphy. Then again, Holland knew his payroll predicament when he approached Larionov in November, offering $4 million over two years. Larionov countered with a two-year, $5 million proposal. That's when Larionov had six goals and 22 points in his first 26 games. Then came 15 games with just one goal and seven points, and a likely deal between $4 million and $5 million fell through. Holland won't criticize or even address Larionov's production. But the realization that Larionov had 120 regular-season games remaining before the second year on his contract began may have contributed to the team's cold feet. The Red Wings still want Larionov, Holland said. But although he won't quote a price, the next offer will be considerably less than what was talked about recently. Such a decision could backfire. Larionov retains remarkable skill and has never backed away from challenges - as befitting someone strong-willed enough to stand up to the Soviet system in the 1980s. He forced the Red Wings to pay more than what they wanted on a three-year deal back in 1997 after the team won a Stanley Cup. And he had two assists in Saturday's 5-3 win over Anaheim. Holland won't say when negotiations might start again. "I don't know the answer," Holland said. "My only answer is as I go forward and know what the (payroll) numbers look like." While fair with players, the organization has been unsentimental. Important and popular players have been traded and allowed to leave when the organization felt their demands exceeded their value: Dino Ciccarelli, Mike Vernon, Slava Fetisov and Bob Rouse. Larionov could be next, unfortunately, despite being the best third-line center in hockey. "We may be looking at making tough decisions," Holland said. DETROIT - Upset by the abrupt end of contract talks with the Detroit Red Wings, Igor Larionov vows not to go out like fellow Russian Slava Fetisov did. "I'm not happy and I'm going to wait for the summer to see what happens," Larionov told hockey columnist Tony Gallagher in today's Vancouver Province, elaborating for the first time on the subject. "Right now I have to be professional, play the game, give my best to the team and try to win the Stanley Cup. "But this is what happened to Slava, and I don't want to be in his position where they gave him a contract at the last minute, which was humiliating to him after what he had done for the team and what he would have continued to do for them." 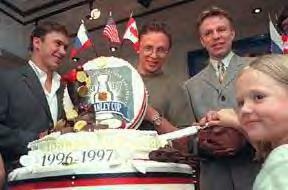 Fetisov became an associate coach in New Jersey in 1998 after declining to take a substantial pay cut in Detroit. The Red Wings recently withdrew an offer to Larionov that would have paid him $4.3 million for the next two seasons. The 39-year-old Larionov told the Province that the two-year offer was the team's idea. "I never asked for two years," Larionov said. "I wasn't even thinking about more than one because it is a long time away and I enjoy the team. They were talking two. My problem in these negotiations is that I'm always too nice. I don't want to be a holdout or ask for everything. I was too nice in Vancouver, in San Jose and now here. "But that's the way I am." Larionov left the impression that he plans to play next season, whether it's in Detroit or somewhere else. "I can't talk about next year," he said, "even though I have some thoughts." 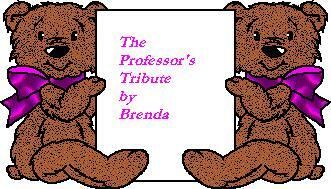 The Professor's class is still in session, although he is past his 39th birthday. Strong start helped give him 31 points, third-best on the team. Has slowed lately, and talks about a contract extension, once in serious stages, have stalled. Thanks go to Papa Tarasov also CCCP website , Igor Larinov Appreciation Society website,Hockey Over Time, San Jose Sharks, and Daugava for the recent article reprinted on Red Wingers Mail List! Very very special thanks go to Chuck Grillo for giving us his perspective and taking the time to do so! Special thanks to Igor for being so special!